Editor’s Note: We’re happy to announce that today fly fishing photographer Tim Romano will begin blogging for MidCurrent on photography gear and techniques. Look for Tim’s regular comments on topics weaving together equipment, perspective, technology and tricks for getting better images of fish and fishing. Need a solid point and shoot to throw in your vest or chest pack, but worried about water, dirt and freezing temps? What about HD video capabilities? 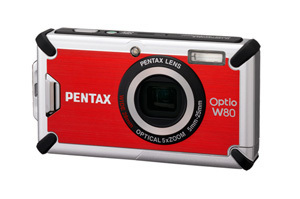 Pentax just released the Optio W80 as their latest entry in the growing world of high powered, feature loaded waterproof cameras. Pentax claims the W80 can shoot in temperatures from 14 degrees Fahrenheit, be dropped 3.3 feet, and completely submerged up to 16 feet. It shoots 12.1 megapixels, has a huge 2.5 inch LCD screen, “face-detection” system, shake reduction technology, and super macro mode — allowing shots from as little as 1 centimeter away. The lens is a fairly fast internal zoom with a 35mm equivalent focal length of 28mm-140mm. The kicker for me though is that this tiny little camera shoots HD movies at 1280X720 pixels, even underwater. Point and Shoot cameras have gotten cheaper and way more powerful in just the past year alone. I have an older version of this same camera and love it. My new W80 came today in the mail. I’ll give a full report after using it in the “field” for a couple weeks.